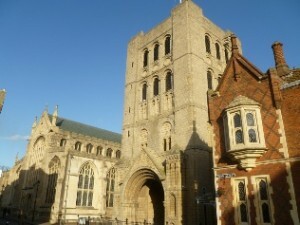 Bury St Edmunds is a historical market town situated just off the A14 in West Suffolk. The town is one of a few in the country that has a cathedral (St Edmundsbury), with a newly completed tower which is situated alongside the renowned Abbey Gardens. The town possesses museums, an art gallery, a new shopping centre, which includes ‘The Apex’ (an entertainment venue), and also, according to the Guinness Book of Records, the smallest pub in Great Britain, the Nutshell. A myriad of relatively small shops is situated around the town centre, which is largely pedestrianized between 10am-4pm, with larger supermarkets on the outskirts. Bury St Edmunds is within fast easy reach of Cambridge and Ipswich. Other notable towns, Kings Lynn, Colchester, Norwich and the coastal resort of Felixstowe can be reached in about one hour or less.